This weekend, the G7’s finance ministers are gathering in Iqaluit, in the Canadian Eastern Arctic, to discuss the fallout from last year’s global economic meltdown, as well as how best to prevent the same from happening again. The meeting comes amidst questions about the on-going relevancy fo the G7 in the face of the creation of the G20 to handle the global economy. That the meeting is being held in the Arctic is both interesting and significant, as Canada is currently attempting to bolster its claim to various lands and waters in the Arctic, as are the US, Russia, Norway, and Denmark. That the G7 is meeting in the Canadian Arctic is surely no coincidence. 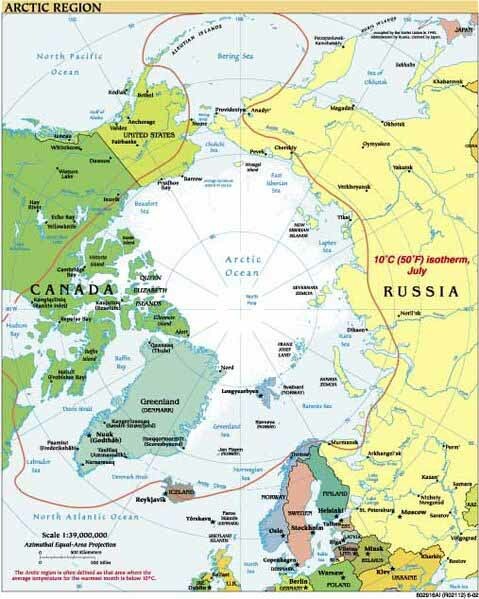 Canada is also caught up in a sort of new Cold War with Russia, its neighbour across the North Pole, in the Arctic. Russia has just announced it is going to spend another $50 million USD on hydrographic and geophysics research along the Arctic Ocean bed. This comes as Canada, Russia, and the other Arctic nations face a UN-mandated deadline to register their claims to the Arctic according to the UN Convention on the Law of the Sea. Norway did so over a year ago, whilst the other 3 Arctic nations. The 5 Arctic nations face staggered deadlines, Norway’s was last year, Russia’s this year, Canada’s in 2013. Denmark has a claim to the Arctic through its possession of Greenland. Under UNCLOS, panels of scientists will assess the validity of uncontested claims in the Arctic, but the 5 nations themselves will sort out their own disagreements when it comes to disputed claims. For example, Canada’s mapping effort is focussed on proving that 2 massive under-water mountain chains, the Alpha and Lomonosov, are geologically connected to North America. If this is indeed the case, not only will Canada benefit, but so, too, would Denmark and the US. Hence, whilst Canada is carrying out the majority of the mapping work, it periodically co-operates with the Danes and Americans. Meanwhile, both Canada and the US will come to loggerheads over the Beaufort Sea and its oil & gas reserves, whilst Canada, Denmark, and Russia are expected to have competing claims to the territory around the North Pole. And then there is the battle over the Northwest Passage. Canada hopes to prove the waters within the Arctic Archipelago belong to it, meaning the Passage would be Canadian. This would limit access to the Passage as a shipping chanel as global warming causes the ice in the passage to melt. You are currently reading The Arctic: The Final Frontier at Matthew Barlow.